The Boyd Theatre, once located at 19th and Chestnut Streets in Philadelphia, was the original home of the Dickinson Kimball pipe organ. 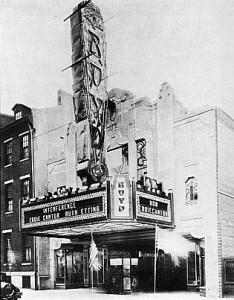 Built during the golden era of the movie palace, the Boyd first opened its doors to the public at 2:00 P.M. on December 25, 1928. On the screen was Paramount Picture’s first all-talking picture, Interference, featuring Evelyn Brent, Clive Brook and William Powell. Featured in an accompanying Vitaphone short were Eddie Cantor, Ruth Etting and Bobbie Arnst. Also on the bill was Walt Disney’s first successful cartoon (in sound) Steamboat Willie, starring a mouse who would later to become known as Mickey Mouse. Through the years, such films as Gone With the Wind, Dinner at Eight and This is Cinerama! had their premieres at this theatre. The Boyd’s decor was a departure from the usual Louis XIV and Moorish styles of movie palaces of the time. Rather, it was a superb example of the Art Decostyle that was beginning to be in vogue. Far in advance of its time, the rich beauty of the Boyd Theatre was dedicated to the progress of women in the history of the world. Murals, stained glass insets and statues symbolized the supremacy of women, with a great mural atop of the proscenium, depicting the defense of the Amazon Queen against the warriors of Asia on one side and African warriors on the other. The theatre’s theme was continued by a succession of murals down the sides of the proscenium and along the walls of the auditorium. A series of modernistic gold and black metal silhouettes set in illuminated niches along the sides of orchestra floor created a striking effect. These beautiful works of art represented women of different cultural and ethnic backgrounds. A live feature at every performance was the playing of the Boyd’s grand organ, situated on a separate lift, to the left of the orchestra pit. Built by the Chicago firm of the W.W. Kimball Company, the instrument (opus 7050) featured 19 ranks (sets) of pipes and a three-manual, horseshoe-style console. In keeping with the decor of the theatre, the console was decorated in French Blue with silver trim. House organists were Otto Beck and Joseph K. Glasner. The organ was used only for a short time, as it was never used to accompany silent pictures. As was customary for many theatre organs of the era, it lay dormant for decades until a memorable evening in 1969. Robert Dilworth, a member of the faculty of the John Dickinson High School, near Stanton, Delaware, had for some time been negotiating with Walter Froehlich of the RKO-Stanley Warner Corporation (successors to the original owners of the Boyd Theatre) about the possibility of acquiring a pipe organ from instruments still installed and unused in RKO theatres. Encouraged by school administrators, Mr. Dilworth concluded a contract for the Boyd organ to be removed for use in the Dickinson High School auditorium. When Mr. Dilworth and his associates inspected the theatre on November 9, 1968, the years had not only taken a toll on the Kimball organ, but also of the theatre itself. The grandeur of old was little in evidence. The magnificent proscenium was all but obliterated from by a Cinerama screen, part of which was even fastened inside the organ pipe chambers. The orchestra pit was raised to stage level and carpeted, but the organ console was remained lowered on its own lift, covered at floor level with a wooden cover. A near generation of dust greeted the inspectors, along with bent and damaged pipes (from the Cinerama screen’s installation), but overall, the organ was found to be, in their words, in excellent condition. A farewell concert was deemed to be practical and thus, on Washington’s Birthday 1969, the great blue and silver console arose from the depths in the theatre for one last time. At midnight, organist Larry Ferrari played the Boyd organ. His opening theme, entertainer Steve Allen’s This Could Be the Start of Something Big, was unknowingly at the time, a prophecy. The Boyd Kimball pipe organ, now greatly augmented through the years, would become the world-famous Dickinson Theatre Organ. Since that memorable night in 1970, a great deal has occurred. First of all, the organ was removed from the theatre and taken to the school. There were many thousands of parts, including over 1200 pipes ranging in size from the size of a pencil to those over 16 feet long and 2 feet square. The console (the part you see) weighed about a half-ton. In addition, there were things like a full size upright piano (located in a chamber high in the wall of the theatre) and a massive relay system that controlled the organ. The big question was ‘Who would be able to help move the organ?’. We were given only two months to get the organ out of the theatre. Since the organ had been donated to the high school, it seemed natural to look to the students for help. along with some adults. The active high school Audio-Visual crew stepped up, not only to help remove the organ but to help install it in the school. The first concert in the high school was just one year after the final concert in the theatre. It was fitting that organist Larry Ferrari, who played the final concert in the Boyd Theatre, play the first concert in Dickinson High School. Over 1200 attended that premier concert event. Since then over 275 concerts have been presented along with a wide variety of other programs – from playing audience walk-in/walk-out stints to accompanying silent film shows, choruses and even the Nutcracker Ballet. Almost from the beginning, it seemed obvious that the organ needed some modifications and additions to allow for a wider range of music and a variety of musical uses in its new home. So gradually over the years additional sets of pipes were added providing a wider range of instrumental colors. That process continued until the mid 2000’s. It now has 66 sets of pipes and two consoles (to allow for organ duets). The organ is owned by the high school. However, the school provides no money for the organ’s upkeep. DTOS provides for the upkeep of the organ by presenting concerts open to the public. In addition, DTOS assists in the maintenance and upkeep of the school’s auditorium to show our thanks for allowing us to operate in their building.